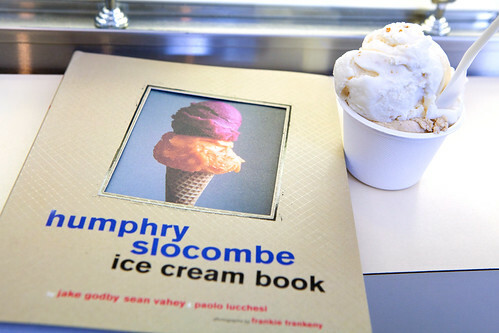 I finally made it to the ice cream Holy Grail…Humphry Slocombe. Probably not everyone would understand the eccentricity behind the work of co-owners Jake Godby and Sean Vahey from the humoruous tongue-in-cheek names to the unusual flavor combinations for ice cream and sorbet. 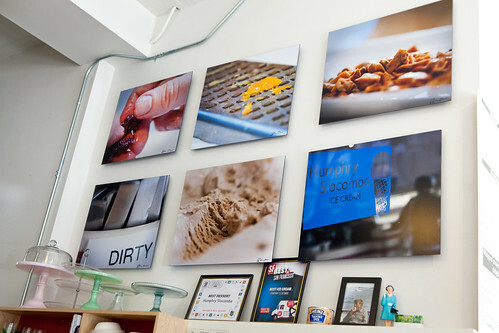 You can almost say they are the West Coast brothers of Big Gay Ice Cream except the latter does soft-serve ice cream. When you enter this ice cream parlor, it looks like a classic, retro ice cream shop – black-and-white tile floor, chrome-and-red-leather stools, simple Formica bar. 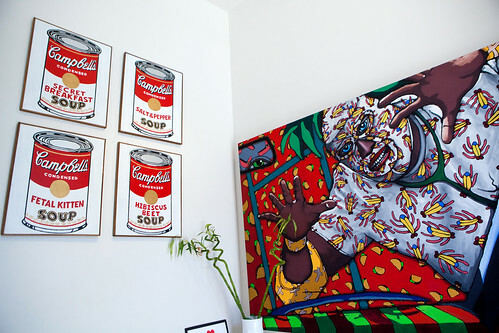 But if you pay attention, there’s touches of taxidermy (a two-headed cow), and near the door, the four Warhol-inspired Campbell’s soup can paintings with mostly their ice cream flavors (except for “Fetal Kitten”), and a bright, bold colored painting of what looks like a luchador wearing a banana print shirt and mask. Their unusual flavors is not meant to be weird for the sake of being weird. It’s just because they think it’s delicious and it’s different than the basic ice cream flavors that are already out there. I was fortuitous to speak one of the proprietors, Jake Godby for a couple of minutes. He’s a very sweet, mild mannered chef who wasn’t formally trained in pastry. He did work his way up through San Francisco’s fine-dining restaurant ranks: Boulevard, Zuni, Fifth Floor and Coi. 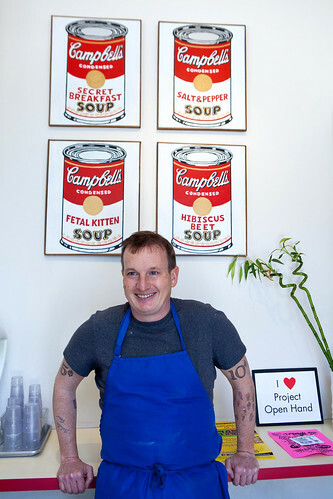 He is involved with the restaurant realm consulting local San Francisco restaurants on their dessert menu. Since my family is up for ice cream, we had one of the shop’s signature flavor the Secret Breakfast with Blue Bottle Vietnamese coffee. Individually, the Secret Breakfast would be my ice cream crack. It’s not too sweet and I love the kick of bourbon. The Vietnamese coffee was robustly flavored with Blue Bottle coffee and the sweet milk balances the bitterness of the coffee. The Candied Ginger was my mother’s favorite. It’s loaded with large nubs of candied ginger and it tastes like a lot of ginger was infused into the ice cream base. The Eton Mess, named after and inspired by the traditional English dessert, tasted of ripened, sweet strawberries with subtle crunchiness of meringue mixed within. 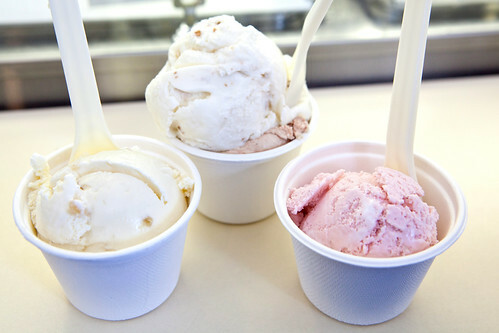 Their ice creams were generally rich and flavorful but not too creamy. The tweak of unusual flavor combinations does make me appreciate their creativity a lot, since I prefer food to push my boundaries of what I’m used to eating. and if you ever get the opportunity – get their ice cream cake! 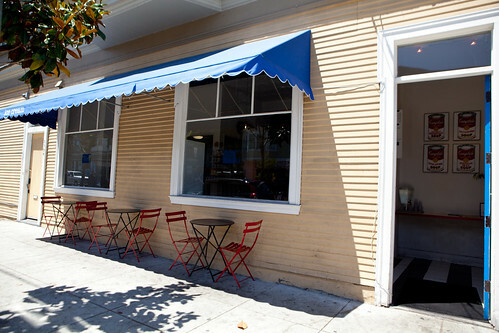 secret breaskfast & blue bottle ice cream in one! I guess I need a friend to ship it overnight in dry ice for my birthday ;) Otherwise, I’ll make the entire cake myself soon.